This skills program is a wrap. Well, really it's about baking fresh enchiladas, in a backcountry camp, without a fire or a stove. Our guest backpack gourmet demonstrates a solar oven that portable enough to be carried in a backpack, and simple enough to build for yourself. She uses her solar cooker to prepare delicious fresh bean and cheese enchiladas with fresh tomatoes. 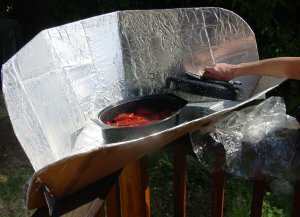 She also mentions other things you can make with a clamshell solar cooker. Follow the supplemental information link below to get the complete recipe and pictures of her and the enchiladas. Ms. Yaffe mentions the non-profit organization, Solar Cookers International, which she recommends as a source for appropriate cook pots and pans. WildeBeat Members can download our entire collection of unedited sit-down interviews with Linda Frederick Yaffe, from each of the three shows she appears in, from our WildeBeat Insider web pages.